until they acknowledge their guilt and seek my face. 4 What shall I do with you, O Ephraim? What shall I do with you, O Judah? like the dew that goes away early. and my judgement goes forth as the light. the knowledge of God rather than burnt-offerings. The photo above is from 2011 on a trip to Kenya for my good Friend Mike’s 50th Birthday. We went to walk up Mount Kenya but spent a few days acclimatising first in Naivasha. We stayed in Dorothy cottage. She had been an influential Methodist Missionary who had met Mike about 20 years earlier when he was based in Kenya as a palliative care doctor, and they had subsequently become good friends. The lake in the photo was Dorothy’s private lake, a seasonal lake that only appeared after the spring and autumn rains. We got up very early before dawn one morning and went down to Dorothy’s Lake. It was eerily quiet and cold as we were high up in the Naivasha Hills. On the lakeside the silence was suddenly broken when the light started to appear behind the hills and the flamingos began to croak and squeak. Soon the mist could be seen on the lake as the sky changed from gold to yellow to red over the space of just a few minutes, and the noise from the flamingos got louder and louder. I can still hear it now. About ten minutes later the massive red sun came into view as it rose over the hills behind and very quickly the temperature increased; soon the sky began to turn blue as the sun accelerated into the sky and the temperature increased to a much more pleasant level. 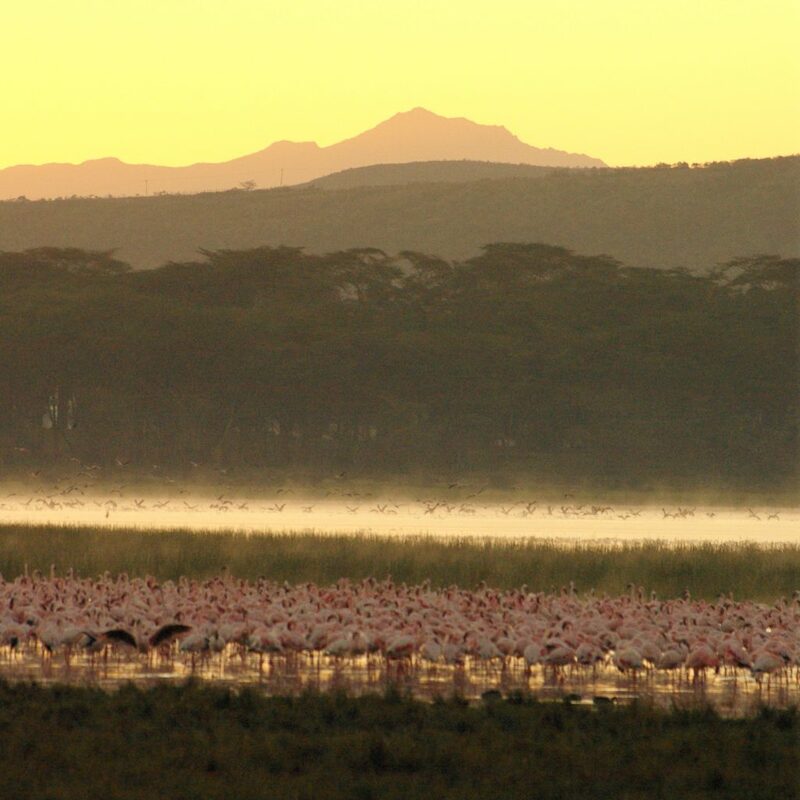 Within half an hour the mist had lifted; the flamingos were wide awake, noisier than ever, periodically taking off one by one, flying a loop of the lake and landing again. It was one of those moments you simply can’t forget. There was something really quite special about Dorothy’s Lake that connected me to the passage from Hosea; I was struck by the various images of creation that are used metaphorically to describe God and the Israelites: dawn, showers, rain, cloud, dew. But looking at Hosea more widely I was also struck by the extent of unbelief and separation from God that there was back in Hosea’s day and the similarities we see in our societies around the world today. Jill Duff (former head of St Mellitus North West and now Bishop of Lancaster designate) has described this separation from God in the UK as a ‘blanket of unbelief.’ What can be done about that blanket of unbelief we have today? The first of the twelve Minor Prophets, Hosea wrote his prophetic text approximately 760 BC, at around the time of the fall of the Northern Kingdom of Israel. The Book of Hosea denounces the worship of gods other than Yahweh, the One True God, and it metaphorically compares Israel’s abandonment of Yahweh to a woman being unfaithful to her husband. In the first half of the book up to our reading today, the relationship between Hosea and his unfaithful wife Gomer is set out in parallel to the relationship between Yahweh and his unfaithful people, the Israelites. The eventual reconciliation of Hosea and the adulterous Gomer is a hopeful metaphor for the eventual reconciliation of God and humanity. Hosea prophesied during a dark and depressing period in Israel’s history during the era of the Northern Kingdom’s decline. The Israelites had turned away from God to worship Baal, the Canaanite storm god, and Asherah, a Canaanite fertility god. Because of this turning away from God, unbelief had become socially acceptable; it had become the norm. the Israelites beg for the LORD’s favour. God’s withdrawal was so that the people would come back to him. In the first three verses of Chapter 6, Hosea prophesises the response from the Israelites to God’s call for repentance. As I read those verses though, it seems to me as though they are rather flippantly assuming God will come back without the need for true repentance. There is no real sense of regret. they don’t seem to want to love the LORD. And I think the ‘showers’ and ‘spring rains’ referred to in that verse point us towards the action of the Holy Spirit from Pentecost onwards. Just as the rain falls where it is needed, so the Holy Spirit acts where the need is. refers to Jesus’ death and his resurrection three days later but there is no consensus on this because the word day here is translated from the Hebrew word yom, which could be a day or refer to a longer period of time. Maybe the use of the number three to signify wholeness is more significant here, with Hosea pointing towards God’s plan to reconcile everything in creation to himself ultimately; to bring wholeness. God wants love that will last not superficial action. He wants a relationship that comes from the heart. In his book ‘Take Heart,’ Matt Chandler reminds us that God has a plan. And just as the Israelites and their unbelief of God in Hosea’s day were part of that plan, so the situation we face today is part of God’s plan too. But, Chandler says that we are now uniquely placed in the church to have a truly significant impact. Trusting that God does indeed have a plan, what is needed is Christian courage in the face of the unbelief we see today. the dawn is like Jesus’ presence; reliable, steadfast and true. the temporary lake filled with the spring rain is like the effect of the Holy Spirit; going where it is needed. the morning mist over the lake is like the mainstream society we live in today; one that has had an evaporating faith; a society needing to turn towards God; to repent; a society of predominantly unbelief. But how can we tackle the unbelief we see today? In the photo are flamingos, lots of flamingos. We, as Christians, are like the flamingos, and we are an important part of the answer to my question. As the morning mist continues to evaporate we need to remain at the lake; reliable, steadfast, courageous and true to Jesus’ teachings. We need to croak and squeak loudly like the flamingos! As the sun rises just as the flamingos periodically fly around the lake; we need to go to where the Holy Spirit needs us whilst also sticking together; keeping in close contact so we can support and encourage each other. In many ways the society we live in today is very much like the one Hosea lived in but today we have Jesus and the Holy Spirit on the scene and on our side. Just as we seek repentance through walking with Jesus and allowing the Holy Spirit to work within us, we have the immense privilege of being able to inspire others to do the same. It’s so exciting to imagine what God has in store for us all. And we can see and feel God’s plan starting to come across the country. Exciting times are ahead! Let’s be like the flamingos on Dorothy’s Lake and help God dramatically lift the blanket of unbelief! Meet Puck, Othello, Hamlet and Bottom, the Shakespeare Boys. We’ve had our four teenage donkeys for nearly four and a half years. They were abandoned and we adopted them from Bransby Horses in Lincoln through their ‘Friend for Life’ programme. 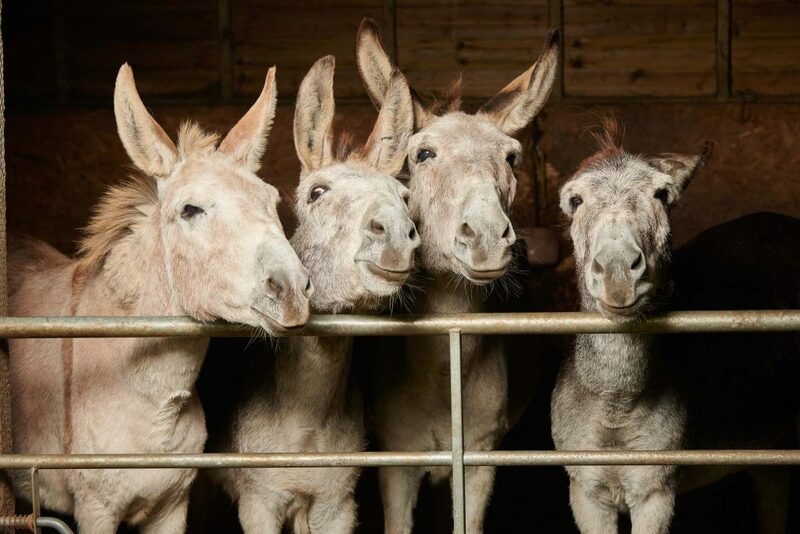 The folk at Bransby Horses have a great sense of humour – hence the Shakespearian names! and to lead them to you. which we once had with all your creation. for they are your creation. who are suffering as a result of our neglect.